What is productisation of services? How to make services seem vivid? What is service innovation? These were some of the questions to be answered in a half day seminar I took part in at Aalto University, Otaniemi a couple of weeks ago. 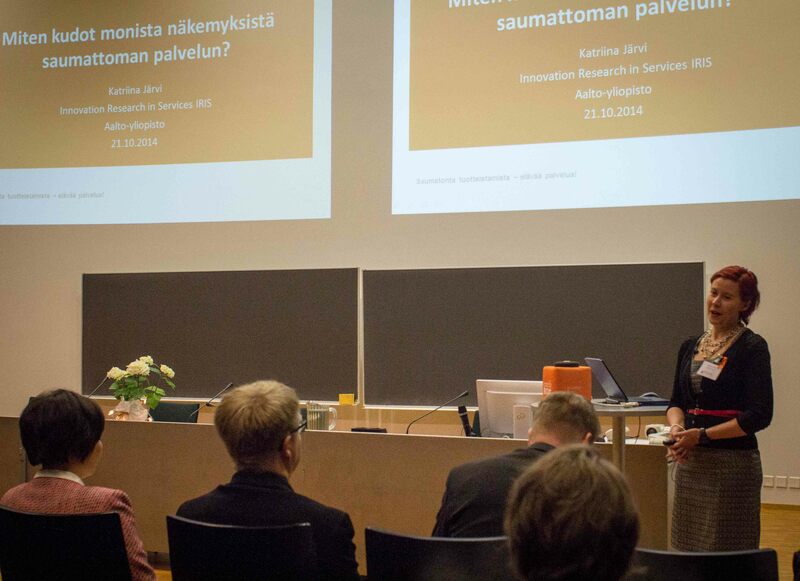 The seminar was opened by Miia Martinsuo, Professor from Tampere University of Technology. The seminar’s purpose was to go through the results from the LEAPS (Leadership in the Productisation of Services) –project, which Miia introduced in her opening speech. LEAPS -project aimed at understanding service productisation and productisation processes as common learning and development platform for service personnel, management, and customers. The project’s goal was to identify leadership models that support such processes. The project lasted 3 years (2012-2014) and was mainly funded by TEKES Serve –programme. The partners included were Elisa, LähiTapiola, Innotiimi and QPR Software. Miia also shortly talked about what seamless service productisation and vivid services mean by using metaphors of knitting a seamless pullover and how the material of the pullover seems vivid. Katriina Järvi presenting at the service productisation seminar. Next Katriina Järvi, Project Manager from Aalto University, opened up the subject of seamless productisation of services. She explained how to weave seamless services from many different viewpoints by taking us through a journey, or hike, to seamless productisation. Katriina explained that getting ready for the seamless productisation of services is just like preparing for a hike and you first have to start raising your fitness level in order to reach your goal. While getting fit, you have to consider what to pack in your backpack and create a common understanding of the goal. The productisation process is a planned but flexible process. Katriina instructed to pack at least the following ingredients in your backpack. The first take away to be packed is the two levels of the service productisation; external and internal. External productisation is the part that is visible to customers and internal productisation includes for example the internal processes and responsibilities and how those are implemented. Secondly you have to remember that it’s not always simple and easy. There are risks and challenges to be taken into account. People are different so there has to be room for customization. You should also practice co-creation. Third take away is the service concept including service promise, process, and resources. Fourth thing to pack in your back is the service procuctisation cycle. The phases in the cycle are; clarify goals (recognize the need for productisation), map current situation, shake current views, form a common vision, and assess and simulate end result. Finally, Katriina concluded that service productisation should be based on common understanding, openness and co-creation. I found this presentation very informative and was really able to learn from it as she was comparing the service productisation process to a hiking journey. This kind of learning by visualization really works for me when trying to pick up the most necessary messages from a presentation. 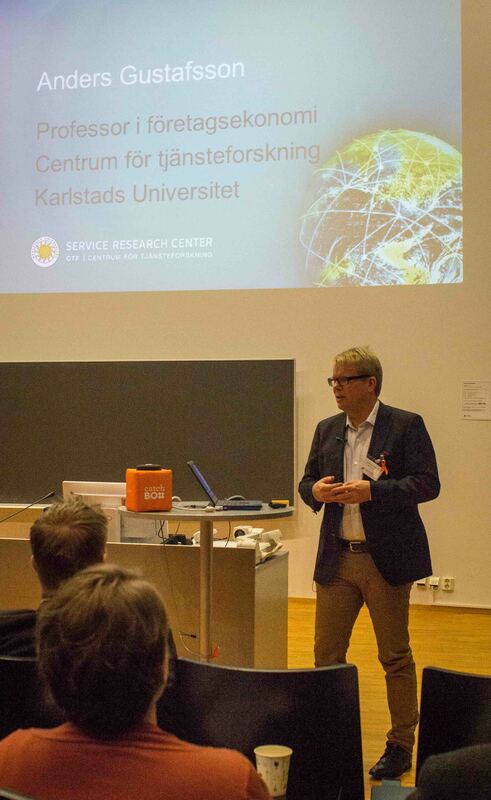 Keynote speaker of the seminar was Professor Anders Gustafsson from Karlstad University. Professor Gustafsson started by talking about the importance and increasing role of services in economies. He explained that services have become more and more consumer-driven and ‘design your own’ –type of services. The new consumer has control over what and how to buy. In order to compete, companies must prioritize solutions and experiences in their service offerings. The thinking has shifted from goods-dominant logic to service logic where service is a perspective of value creation, co-creation of value is key and the focus is on value-in-use. In fact, everything can be viewed as a service! Professor Anders Gustafsson opening up the subject of service innovation. What do you compete with? Service innovation includes different aspects of innovation; experience innovation, brand innovation, social innovation, process innovation, and business model innovation. Behavioral innovation is the foundation for all of these. In brand innovation you focus on differentiation. In experience innovation the focus is, naturally, on the experience. Process innovation considers how to make systems seamless. Business model innovation includes the changing perspective on financing while social innovations consider the helping out perspective. The challenge in service innovation is, as Churchill put it: “Success is the ability to go from one failure to another with no loss of enthusiasm”. Company culture should also be based on a fact that customer is the key and the culture needs to be ready to bring customers to innovate and co-create. To be able to innovate spend time with your customers and engage them. However, don’t ask them what they want. Professor Gustafsson mentioned during his presentation that his experience is that companies still need to be reminded quite often that listening to their customers actually pays off. This issue keeps amazing me as it seems like that it would be obvious. He also mentioned that there aren’t so many tools yet for service development when compared to more traditional product development. I would have to disagree a little with this note as I think that there are already plenty of tools to be used for service development as well. After a coffee break it was time to go back the results of the LEAPS –project. Researcher Doctor Tiina Tuominen from Aalto University explained us how to create vividness in productized service. First of all there are challenges to be taken into account. For example, in big organizations it is difficult to keep a common understanding while developing a model for productisation of services. Therefore, productisation of services is often a separate function within an organization. It’s also worthwhile to consider how productized service will develop without innovation suffering as a consequence. The lack of these elements will reduce the vividness of productized services. Also Tiina pointed out that the key to success in service productization is creating a common understanding. Miika Nurminen from QPR Software and Tiina Metsävuori from LähiTapiola discussed their experiences of service productisation and taking part in the LEAPS –project. They agreed that the end results were satisfying. It was discussed that there should be a sufficient amount of varied services available for customers. Again, the importance of clear goals and common understanding in service productisation was brought up. Tiina nicely summarized the concept of productisation as follows; the crystallization of the service and the value it offers. In the final part of the seminar Dr. Jarno Poskel from Innotiimi Oy took us through five steps of the service productisation workshops. Discover producisation path by asking what and how? Take service development model as a basis for workshops including organization, service process, service concept, and resulting service. Find the courage to use different tools and don’t forget innovation. Take into consideration the activity curve. In reality you may have 4-5 workshops and do some work in between and naturally the intensity of action fluctuates over time. Pay attention to facilitation (opening, implementation and ending of the workshops). 5 steps to successful productisation workshops. In the end it was clear to me that the key to successful service productisation is to set clear goals with a common understanding. If you wish to dig a little deeper in the subject the presentations of the seminar are available here (mostly in Finnish). Furthermore, you can check out the other outcome of the LEAPS -project, which is the Handbook for productisation of services (in Finnish). The handbook was published 21.10.2014. It gives tips and inspiration for customer-oriented service productisation.